In 2017, Singh et al. 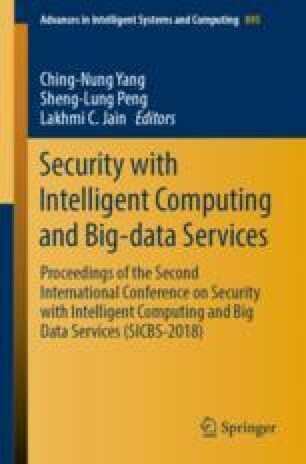 constructed a secure cloud-based (2, 2) secret image sharing with the capability of tampering detection using (r, n) Permutation Ordered Binary (POB) number system. This scheme can solve the problem of secure storage of image-shares at cloud servers, and is also capable of authenticating image-shares at pixel level. However, Singh et al.’s scheme assumes that participants already know the parameters r in (r, n) POB, on which they can recover each image pixel efficiently. In fact, the distribution of parameters r is not that easy as described in their scheme, it needs secure channels and the storage of r is almost same as the share. In Singh et al.’s scheme, the authors did not show how to share the information of r among participants. In this paper, we proposed a new secret image sharing using (r, n) POB number system which is extended from Singh et al.’s framework. In our scheme, the parameters r for all image pixels are identical and are publicly published. Thus, the problem of Singh et al.’s scheme is solved. In addition, our scheme can also authenticate tampered shares at pixel level. This work was supported by National Natural Science Foundation of China under Grant No. 61502384, and in part by Ministry of Science and Technology (MOST), under Grant 107-2221-E-259-007.